Noah gets to work on a Celtic cross tattoo. Action-packed drawing! Halfax is a happening place? Love The Herald piece, you are so very, very talented. Bout time everyone knew. Thanks very much Donna, appreciate your comment. All the best, Russell. 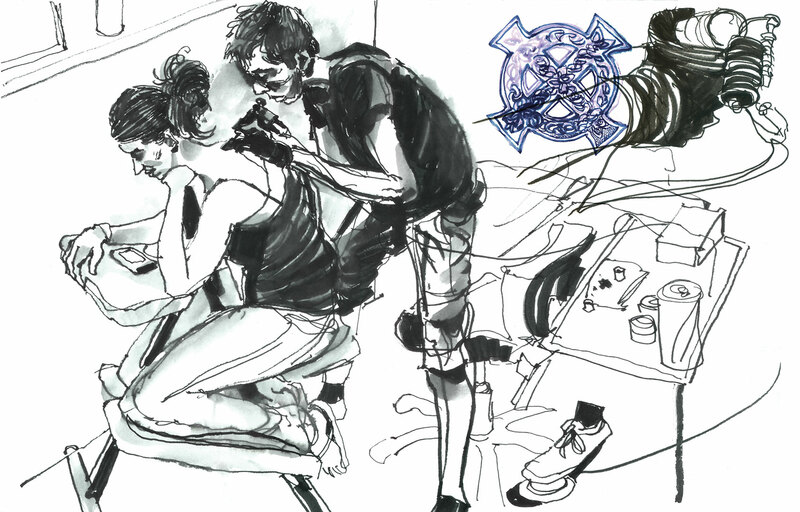 Russell, are you going to be designing your own tattoo? Beautiful drawing! They asked me this question in the shop, I’m not sure, I’m so fussy with my own drawings, I’m sure a tattoo would irritate me after a while. Thanks for commenting, Russell. Thanks Rosa, appreciate you dropping in, Russell.